The house is starting to look closed in this week. The clay tile roofers came for 3 days and have already made good progress despite some very wet weather. Alan and Graham have put building paper around the framework and have almost finished the roof structure. There was a panic on Wednesday when we discovered that the design did not allow for anyone taller than a midget to get into the crows nest! After a few hurried visits from the architect, the roof pitch has now been changed slightly and it looks fine (triangular piece with fascia above). Scaffolding has also been erected along the front of the house which will probably be required until it's completely finished. 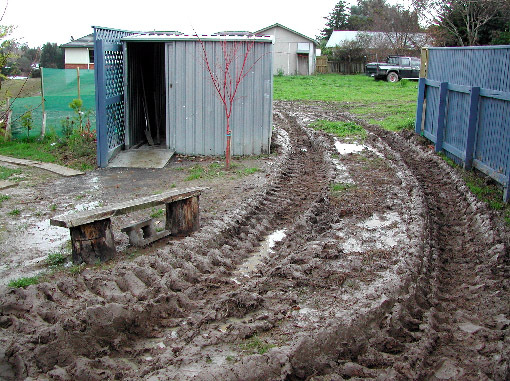 Our back yard looks more like an off-road four-wheel-drive course at the moment.